A drive on a rural Alberta highway took a terrifying turn after lightning struck the vehicle, trapping an elderly couple inside. Al and Betty Perry were travelling on Highway 14 near Tofield, Alta. on Saturday when a fireball engulfed their silver Chevy pickup truck. 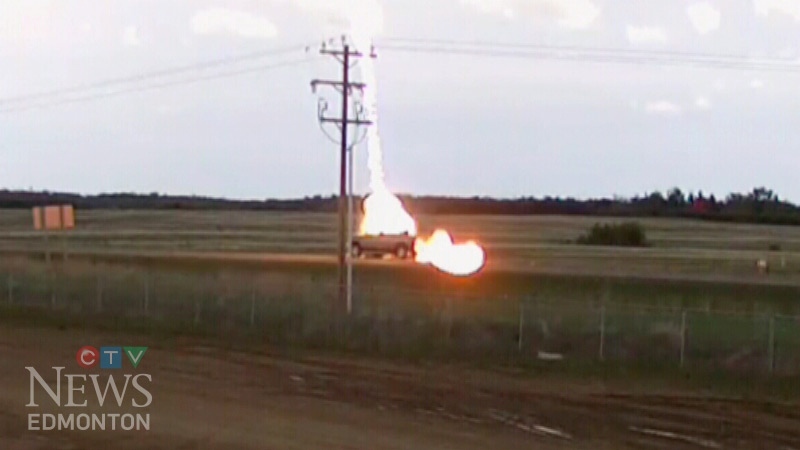 "It sounded like a sonic boom, that's how loud," Al Perry told CTV Edmonton. "I saw our lives pass in front of my eyes." After the lightning strike, all of the vehicle's airbags deployed, parts of the truck completely melted from the heat, and smoke began to fill the cabin. The couple said they were unable to see, and there was a loud ringing in their ears. The doors and windows of the truck also locked. Perry tried to kick out the windows of the vehicle, but he was unsuccessful. "I don't know how many times I tried and tried," he said, adding that he quickly realized that he wouldn't be able to escape from the truck. "I thought, how are we going to get out of this thing?" he said. "This is a coffin." 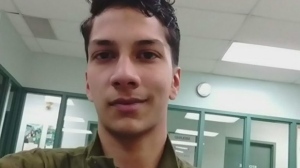 Meanwhile, outside, an RCMP officer who happened to be driving by helped the couple escape. Two massive craters on the highway mark the spot where the lightning hit. A few days after the terrifying ordeal, the couple celebrated their 47th wedding anniversary. A still taken from surveillance video shows the moment lightning struck a truck that had Al and Betty Perry inside.